Looking at the DxOMark score map, the score remains high up until f4. In low light condition, at 5.6, a photographer will have to increase the ISO and by consequence the noise will impact the global image quality. On its resolution aspect this lens is very sharp between 2.4 and f8. Resolution suffers a bit on the larger apertures (especially at 1.4). 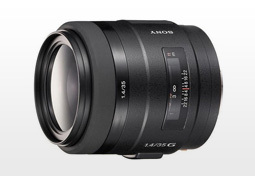 This lack of resolution at 1.4 would explain why this lens does not score as well as the aforementioned Sony lenses. Mounted on a Sony A700 the score remains pretty high (12). Resolution is not as good as on the A900 of course, but with 42 lp/mm the score is pretty close to that of other G-series Sony lenses. Transmission is a bit low: TStop is only 1.7, this sensor does not capture light as well as the A900‘s. Nevertheless it would be worth noting that other APS-C models have performed worse, for example the TStop measured on the A380 is 2.1, which means that more than 1 EV lost. For more information on Tstop read our F-Stop blues article. To summarize, the Sony 35mm F1.4G is a very good choice for any photographer with a full frame camera like a Sony A900 or a Sony A850 looking for wide angle and fast lenses. On smaller sensor cameras (APS-C), the global amount remains pretty good; however other choices are available and they might be cheaper. Sony 35mm F1.4 G mounted on Sony A700 vs Nikon AF-S DX Nikkor 35mm f/1.8G mounted on Nikon D300 (please, remember to change the body type). Sony 35mm F1.4 G mounted on Sony A700 vs Pentax smc 35mm f2.4 AL mounted on Pentax K20D (please, remember to change the body type). Sony 35mm F1.4 G mounted on Sony A700 vs Sigma 30mm F1.4 EX DC HSM Canon mounted on Canon EOS 50D (please, remember to change the body type).